Who knew the toughest Legion boss would be found in one of World of Warcraft's oldest dungeons? World of Warcraft players have been finding secret bosses ever since the Legion expansion launched, and now they've found another one. News of the find popped up on the World of Warcraft subreddit, in a thread by user Nexeoes. Surprisingly, the new boss isn't found anywhere in the Legion content. Instead, you'll have to travel to the depths of one of the game's earliest dungeons: Gnomeregan. The post notes that you will need to have all five players in your party "EXTREMELY geared." Once you've pulverized the low-level enemies that stand in your way reached the final boss, don't kill him. Instead, you need to go to the first pillar on the left. Behind that pillar, you'll find a small button that says "PUSH ME." 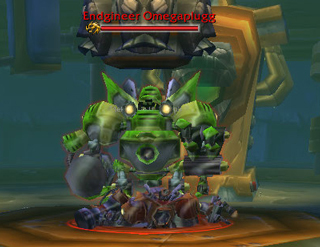 This will summon the new boss, Endgineer Omegaplugg, who appears, destroys the normal end boss (Mekgineer Thermaplugg), and replaces him. He comes complete with 207 million hit points and a number of devastating abilities, any one of which could kill most characters in a single hit. Suffice to say that you'll be looking at bombs, lasers, missiles, and more. If you manage to take him out, you'll receive a toy named "Vial of Green Goo" which transforms your character into a leper gnome. You can find more information on the boss' abilities in the Reddit post linked above. It's good to see that Blizzard has hidden some goodies all over the world for WoW players to find. Who knows what might turn up next?